We hold expertise in offering precision engineered Combination Spring Hanger (50 mm). Our designers utilize G.I. Steel in making Combination Spring Hanger conforming to ASTM B â�� 117.l. The hanger is powder coated to 100 microns paint thickness. 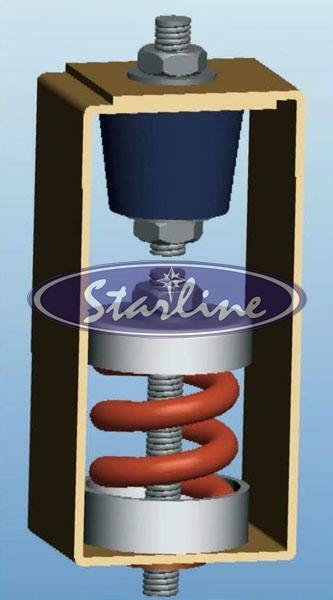 The Combination Spring Hanger, that we offer, is extensively used for suspension of heavy rotating equipment such as air handling units, fan coil units, ventilation fans, large variable air volume boxes, pipes and air ducts in mechanical rooms. It is highly effective when vibrations of high frequency and large amplitude are present. 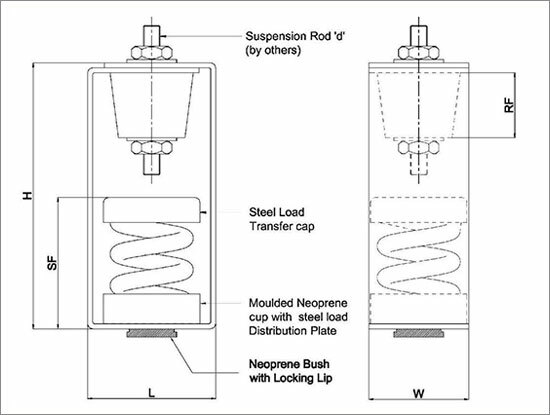 Ensuring double protection against transmission of noise to structures, our Combination Spring Hanger features neoprene component and molded neoprene cup below the spring.